Lambourn or Newbury - Can you help? These pictures were taken by Joe Thompson an American airman based at Membury during 1942/3. 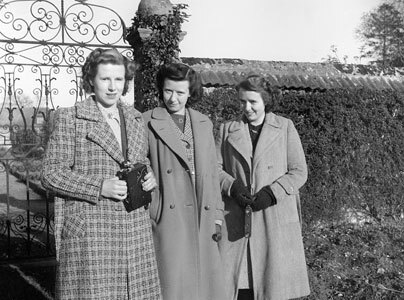 The ladies in the picture on the left have been identified by Arabella Agar whose mother, Angela Barwick, is in the centre. She is flanked by her sister Diana on the left and Valerie on the right. They are standing on the lawn in front of the gate leading into the walled garden at Inholmes Estate, Woodlands St Mary, with the engine house in the background. When I first saw the badge shown below I was told it was the Wiltshire Home Guard's wartime formation sign. However, whilst researching my book 'Look, Duck & Vanish' I conclusively discovered that it was a device worn during WW2 by the Wiltshire Army Cadet Force. 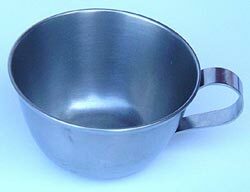 The cup, shown below, was discovered during the war by Mr Charles Rosier who worked at Littlecote as a gamekeeper. It was found in Cake Wood following an exercise involving American troops, and has been kindly given to me by his daughter Mrs Norma Tubb. Mr Jeffrey C. Hodgdon tells me that the cup is typical of those found in an officers mess outfit. Mr Bob East backs this up and says "I retired from the US Army in 1998, and proudly served a tour in the 82nd Airborne Division. During my career I saw drinking cups like this all the time. They were in the commanders mess kit. 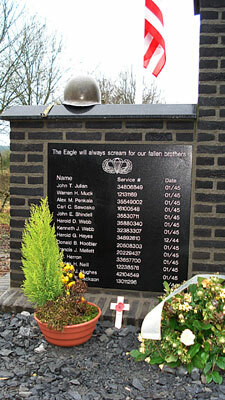 This was from company commanders, on up the chain of command." Can anybody please tell me more? 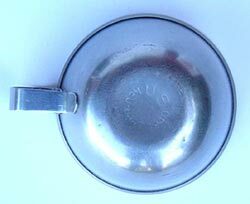 The wording on the base reads:- NEU-BART US 1940. Can any reader help me to identify this gentleman. 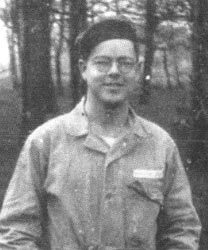 He was with the 437th Troop Carrier Group based at Ramsbury airfield and we believe his name may be Russell Bear Jr. 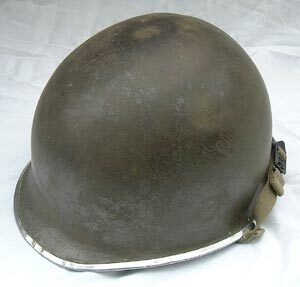 This US steel helmet was found by Mr Chris Freeman about 25 years ago at Littlecote Park Farm. Chris was anxious to discover its original owner and Bill Huntington has kindly provided the necessary clues. "I visit your website quite often and I think I may have a possible solution for one of your Mystery Corner items. 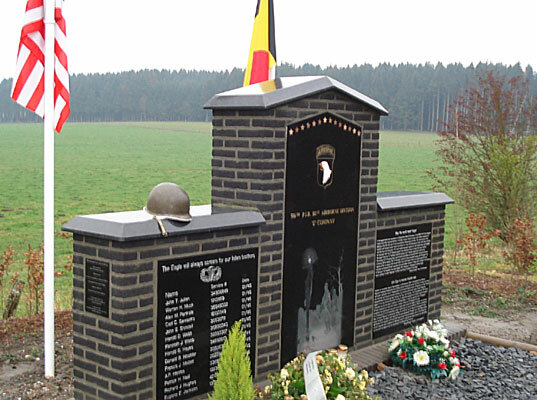 The helmet may have belonged to the following individual killed at the Battle of Bastogne on 13 January 1945: Private 1st Class Harold D. Webb, Service # 35880340 Company E, 506th Parachute Infantry Regiment, 101st Airborne Division". See Bill's overlay below. final resting place in Mount Moriah Cemetery Union Twp, Clermont County, Ohio. Chris Freeman would like to take this opportunity to thank everybody who made contact. 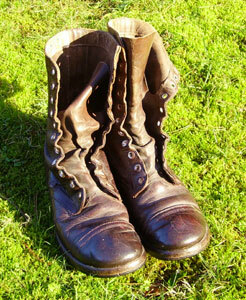 Chris has recently added a pair of US Paratrooper boots to his collection. They were found in the Newbury area and he would like to identify their original owner. 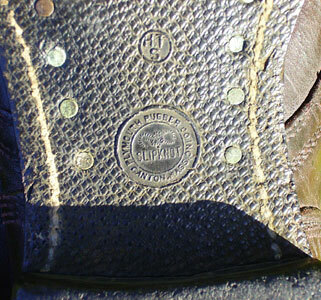 Around the inside of the boot's top rim is a well worn name and serial number (see below). The first name could be Robert - can any reader help? 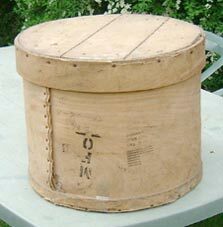 The box shown below was found recently in the Wiltshire village of Aldbourne. Branded or stencilled to the side of the box in different places are the following words, dates and instructions:- From the United States of America, MFO, 8/20/43, 79 1/2 Cheddar Cheese White. 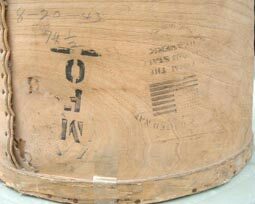 It is clear that it originally contained cheese but can anybody tell me more? This picture has been recently received from Francis Becker, an American serviceman based at Ramsbury airfield during 1944. He would like me to take a comparison picture. However we have no idea where the picture was taken. The only clue I can give is that the location is probably within a 10 mile radius of Ramsbury. 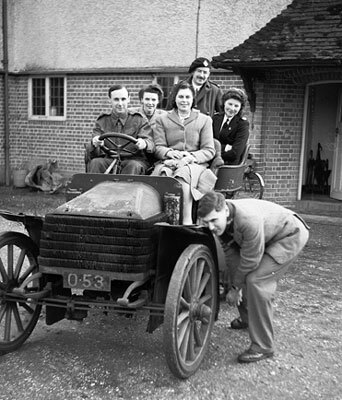 WANTED: Any photographs taken in and around Ramsbury during World War Two. 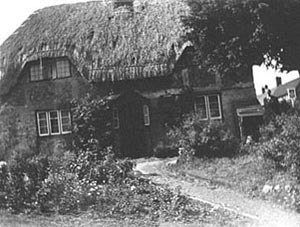 I am particularly interested in seeing pictures of Camp Ramsbury. If you have any wartime memorabilia such as uniforms or gas masks then also please get in touch with me, as I collect items such as these and regularly display them at exhibitions.